Eat REGULAR, BALANCED MEALS with CONTROLLED PORTIONS. Less food is better unless you are underweight or malnourished. Eat slowly and mindfully, Eat when you are hungry and stop when you are satisfied. Make EVERY MEAL SMARTLY BALANCED. The major macronutrient groups, carbohydrates, fat and protein with a carbs:fat:protein energy value distribution of approximately 50:30:20 to contribute optimally to your health. 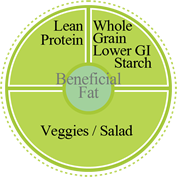 CARB SOURCES should mostly consist of SLOW DIGESTING CARBS and WHOLE GRAINS (low GI carbs, depending on your activity level and the timing of the meal). Quality, lean, UNPROCESSED PROTEIN SOURCES are always preferable to processed, fatty protein sources. FAT SOURCES that are rich in OMEGA-3 PUFAs and MUFAs should be SPECIFICALLY TARGETED, as should other foods that are high in VITAMINS, FIBRE and PHYTONUTRIENTS – these foods can make a major contribution to your health. FOCUS ON FRUIT and a few NUTS for snacks in between meals. Avoid high kJ drinks, but rather drink WATER AND LOWER kJ BEVERAGES. FITNESS is key and ACTIVITY is maximised with a daily goal of 30-60min. If you consume ALCOHOL LIMIT CONSUMPTION to 1 drink a day. Use SALT SPARINGLY and limit salty foods. A plate of food should have half the volume filled with vegetables or salad, leaving one quarter for a serving of lean protein & the other quarter for a serving of whole grain lower GI starch. Include some healthy fat in every meal. 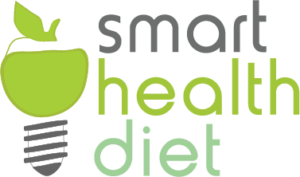 The SMART HEALTH DIET describes a BALANCED diet that is NUTRITIOUS and RISK FREE in every way, with SUSTAINABLE meal plans that all people and age groups can enjoy.